Filed to: new challenger!Filed to: new challenger! After narrowly losing the Battlemodo finale, the Altec Lansing IMV712 was angry, pissed even. A split decision loss wasn't what the heavyweight had in mind as we called a few extra low blows on behalf of the lightweight champion, the Griffin Amplifi. So the IMV712 begged for another fight, requesting the biggest, baddest dock we could throw at him. And it just so happened we had one dock we couldn't include in the competition due to rumored steroid use inflating the price, the $499 Chestnut Hill Sound George. It was the perfect unfair match-up to please our underappreciated IMV712, which is the entire reason we're not doing a head to head. Hit the jump for a more standard review of the Chestnut Hill Sound George. And we'll give you some impressions of how it stacks up to the IMV712. The George...I'm sorry...the GEORGE is Chestnut Hill Sound's only product. And it's clear that there has been enough intent behind the design to base a company. It starts with a gorgeous remote based upon the Zigbee standard (think Wi-Fi with lower bandwidth). The dock downloads your entire tracklist from your iPod and sends it wirelessly to the remote. I didn't notice a delay, but a full iPod can take up to one minute to sync. From here, the interface is flawless, as long as you like the standard iPod menus. Because the layout is copied near verbatim, the differences which include a few convenient quicktabs on the "Now Playing" screen. A clickable wheel has a solid rubbery feel, and works just like Apple's trademark minus the touch sensitivity. The result is zero learning curve. Plus you can scan radio, set the alarm, or activate the line in from the remote. But our favorite part? A snoozesque button on top mutes the sound. The backlit remote is good for about four hours of use, and automatically recharges on the base station. If the Bose Sound Dock was able to deliver on all its promises, it might be called the George. Beucase you get that Bose feeling of balance, cleanliness and resonance, but with a pile of bass that accompanies the high and mids with precision. Listening to folk gave us guitars that could sparkle with vocals that flowed like silk. We appreciated the Griffin despite its over-performing extremes, and there may be similar element of the midrange that seems missing from the George's pop music repertoire, but when listening to classical, these tendencies pay off, offering us clean instrumentation that makes you wish some of your music was recorded at a higher bitrate. To compare the sound quality directly to the excellent IMV712, we'd call it a hair less metallic, and much richer in the lowest ranges (tubas really hit your gut nicely). And the IMV712 is not very good at playing at the most quiet volumes, which is a non-issue for the George. Does it sound light years ($150), better than the IMV712? In the audio world, yes. Most ears will notice a difference in that the George has a real element of sharpness and another finish of finesse in every range. I've had both the IMV712 and the George hooked up for the past week. And I've found myself not only listening to the George more, but listening to music more because of the extreme convenience of the remote. 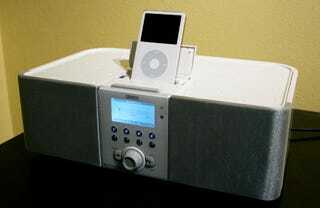 Call it a rich man's iPod dock, or a poor man's Sonos. But I think the George is worth its steep $499 pricetag for those looking for a compact system that can rock a room. Now if only more of us had the money lying around.